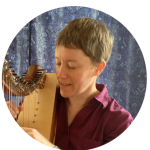 Christina became certified in therapeutic massage by the Boulder College of Massage Therapy in 1992, and certified as a Clinical Musician in 2015. Since then, her goal in all the healing arts she practices – massage, energy work, craniosacral therapy, visceral manipulation, aromatherapy, BioAcoustics, sound healing and therapeutic music – has been to help decrease clients’ stress and pain, so their spirits can soar! She combines many of these modalities in every session to provide what the client needs in that moment. In addition to teaching at massage schools, she has taught classes on stress management and couple’s massage. She also taught English in the Peace Corps in Gabon, Central Africa. The most important thing for her in teaching is to facilitate learning and to encourage enthusiasm and passion for learning in her students. She has lived near or in Longmont, CO her entire life and is happy to be living in a small, familial cohousing community with her extended family and various animals.